A visit to KQV, Pittsburgh studio in 1961 outside of “Walk” – “Don’t Walk” was a turning point in my life. Some weeks later I was paid $2 to play some 45s at the local Catholic church youth club. None of the kids wanted to play records – they just wanted to dance. Being a ‘vinyl junkie’ I was in my element! After basic training in the United States Air Force in ’63, I was fortunate to be posted to England as the British music scene was exploding into world-wide popularity. My interest in broadcasting became a burning ambition when asked to DJ on the AM land-based ‘pirate’ station, X C F T . One memorable episode was when I DJ’d for an 18-hour marathon broadcast which was received in London, 50 miles away, with less than a 100 milliwatts of power! In the 1970s I was hired to present my own show on BBC Radio Oxford . Listener reaction led to a prime time Saturday morning slot. In 1986 I was the first DJ hired on Radio Silverstone the local station broadcasting at the premier motor racing Silverstone Circuit, Northants. At the ’92 British F1 Grand Prix with my Son, Stephen, I set up a broadcast record which was acknowledged by the prestigious Guinness Book of Records for non-stop AM broadcasting from 0530 Friday until 0015 hrs Monday. Three years later in ’95, another Guinness accolade was presented when I organised a complete station operation with National news feeds, 24/7 DJ Ops, competitions and special bulletins about the motor racing world. Never done before on the Formula 1 circuits. This time on quality FM radio. From 1969 through the early ‘90s I hosted one of the best known mobile discos in the area. Due to commitments, the disco scene dying, and some health issues acquired, I was forced to relinquish the mobile operations. The early ‘90s brought enquires from net stations. I didn’t like the commercial radio scene in the UK so I decided to ‘do-my-thing’, play where I want and the music I wanted. This has led to a lot of enjoyment as I’m not restricted to UK radio-formats – – the same 20 records played in rotation with inane chatter & multitudes of commercials throughout the hour. 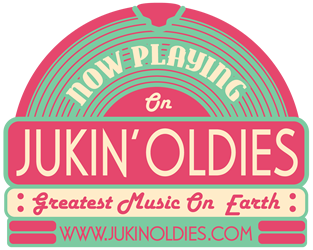 Originally from Pittsburgh, I can contribute to Jukin Oldies an extra touch of Doowop as I was raised in that era. Though I’m a “displaced Burger” (!) based in England has given me better insight to the overall pop music scene. 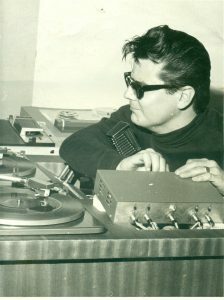 Formats include Doowop and Hits – – USA & UK – – from the 1950s thru to 20th Century hits. Most of my programming is from my “Disti-Disc” vinyl collection. . . .1,000 of ‘hit’ singles and a lot of ‘didn’t-make-it-promos’. . .plus 100s of vinyl LPs, the vinyl is FM-playable. All under the ‘umbrella’ of “20-20 “ musical segues: 20 minutes of one genre; 20 minutes of another; 20 minutes of another. . . . . . . the listener will stay on-station waiting for the next genre of music. . . .Hopefully! You’ve read all the above – – now take a listen to my slot. . . .like a record see ya ‘round! And listen to the Greatest Music on Earth ! ! ! 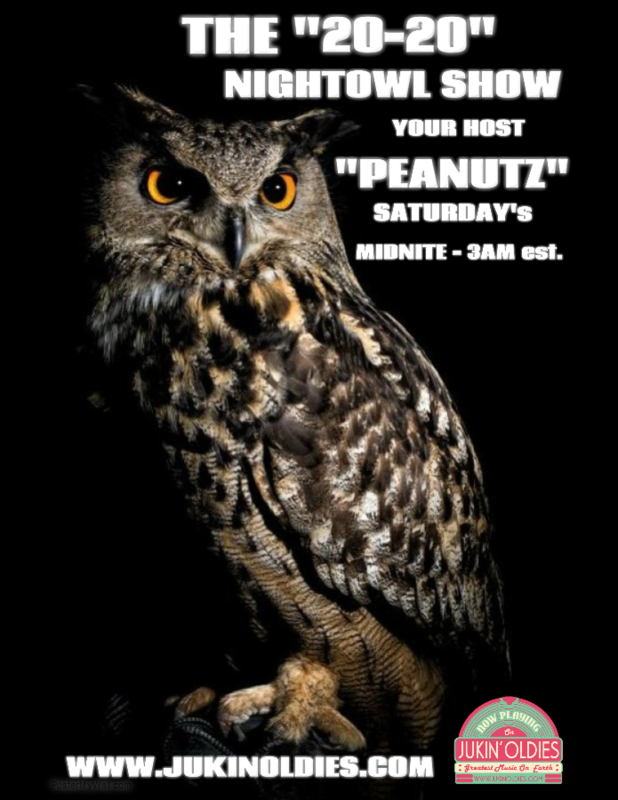 On the ‘Peanutz 20-20’ Night Owl Show!